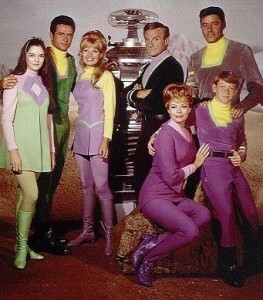 Angela Cartwright (far left) is pictured in a promo shot from the pilot episode of Lost in Space. Angela Cartwright – actress, model, photographer, artist and mom – will forever be known to a generation of TV and movie fans for three iconic roles she played as a child and as a teen: Linda Williams – the back talking brat on Make Room for Daddy; Brigitta Von Trapp – one of the seven Von Trapp children in The Sound of Music, and Penny Robinson – a star-crossed teen who, along with her pioneering family, is still Lost in Space. Ms. Cartwright will be in the Baltimore area this week for the tenth annual Mid-Atlantic Nostalgia Convention. The Baltimore Post-Examiner caught up with Angela to talk about her forthcoming appearance, her new-found passions, and to reminisce about her amazing career. BPE ~ Thanks for joining us today. To start – Happy Birthday! Angela ~ Why, thank you! BPE ~ You’ll be in Baltimore this week for the Mid Atlantic Nostalgia Convention. Could you tell us a bit about the show? Angela ~ I’ve never done the show before, but they’ve been asking me to do it. My sister, Veronica, did it last year. There’s a lot about nostalgic, classic TV shows and actors. I like to call myself a classic. It looks like fun; I know Veronica had a great time. There’s lots to see, and some really great people are going to be there. Lee Majors, Lindsay Wagner; just a lot of cool people. I hope fans come out and say hi. We’ll have photographs and lots of memorabilia to share. BPE ~ 2015 marks a big anniversary for the cast and crew from Lost in Space. What’s been going on with that? Angela ~ It is, indeed. It is also the 50th for The Sound of Music. But the Lost in Space 50th has become quite a bit deal. A special collection of Blu-ray discs are coming out on the 15th of September. For fans of the show, there’s a lot of added parts to the Blu-ray; everything that there was about Lost in Space over the years. I’ve seen it – and it’s really amazing. We did some commentary for it, and when I saw it on the big screen I was blown away. BPE ~ Did Irwin Allen shoot those episodes on video or on film? Angela ~ No, there was no video; it was all on film. I’m not sure if it was technicolor; you’d have to research that. The first year was black and white, but when we went to color, nobody had seen colors like that on television. A lot of the credit has to go to Paul Zastupnevich, our costume designer, who used these pop art colors, and it gave the show such an incredible look. Then of course Batman also came in with that bright vibrant 70’s look. BPE ~ What else is on the Blu-ray? Angela ~ Bill Mumy, who played Will, has written an epilogue, because a lot of the fans have said, “Well, you’re still out there – lost in space. How come you never got back?” Bill had written a script about 30 years ago, kind of giving closure to this family and getting back to Earth. He had taken it to Irwin Allen, and Irwin said, “Eh, I’ve got my own ideas, and I’m gonna do my own thing”, which he never did. For the Blue-ray, we had a table reading of Bill’s script. We had Mark (Goddard) and Marta (Kristen); Kevin Burns was the voice of Dr. Smith. My sister, Veronica, did Maureen Robinson; and Robert Clotworthy, who does the voice of Ancient Aliens, read the descriptions in the script. We got so caught up being who we were – the characters that we were – it was really a blast. BPE ~ It’s funny how, as an actor, you can have such a distance from a character and then step right back in. Angela ~ I know! It’s like putting on an old suit, and it fits perfectly. It got very emotional; we are a family of sorts. It was really neat. And then Kevin put together old footage for it, and added Johnny Williams’ music (Williams wrote the original Lost in Space score). BPE ~ Just seeing the table reading would be worth the price of admission. Angela ~ Yeah, and also the commentary. We sat and watched six episodes. It’s not scripted or anything; it’s just our thoughts, our remembrances. It was like, “Oh my God, I remember that!” I think that will be fun for the fans to hear. The other thing is a project Bill Mumy and I did together. I had finished a book last year, called “Styling the Stars – Treasures from the 20th Century Fox Archives”. It took me 2½ years to put that book together; to go into the archives to sort through pictures that had never been seen before or never meant to be seen by the public. While doing that book, I came across some Lost in Space stuff. Bill loved the book, so we went back and forth, and we came up with this idea of doing a similar book for Lost in Space. We talked to Kevin Burns, who is the keeper of the archives for Lost in Space, and he said, “Absolutely. There’s so much.” So I started the process all over again. What came out of that was our memories, little anecdotes, things we remember; it’s a very personal kind of a pictorial; a real memoir. It’s called, Lost (and Found) in Space. That should be coming out within the next couple of weeks. We’re also going to Chiller Theatre Expo this year with Mark and Marta. The book will be available there. BPE ~ Have you also been busy with The Sound of Music? Angela ~ We did do a picture of the seven kids – I call us the seven kids still – in Vanity Fair at the beginning of the year. That was really terrific because people who watched the movie were linked to the kids. A lot of them see one of the personalities of the kids kind of encompasses what is familiar to them. People love that movie; they just love it. 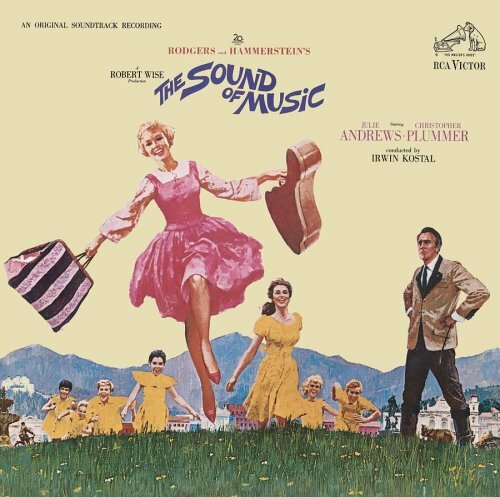 But for the 50th , it was really Julie Andrews who stepped forward and kind of did her memories of doing The Sound of Music, so it wasn’t as heavily into the kids this year. We loved getting together; we’re kind of this displaced family, because we’re all over the world. So there was a little bit for us. There was the Hollywood Bowl sing-a-long, which is fantastic every year. But mainly, it was about Julie this year. BPE ~ You got started in show business at a pretty young age. Three, if I’m not mistaken? Angela ~ Yes, I was three. I was born in England, came over on a boat with my parents, because they had a dream of coming to America. Never in their wildest dreams did they envision having their kids in show business. It just happened for my sister and me. We lived next door to someone who had their child with an agent, and the woman said, “Oh, you should have your kids with this agent.” I don’t know what possessed her to say that, but it started us on a road where we’ve been in show business for many many years. My sister is a very successful actress, and I went right into fashion modeling at three. I was in all the magazines, on the cover of Look magazine. Then I did this movie with Paul Newman, called Somebody Up There Likes Me. 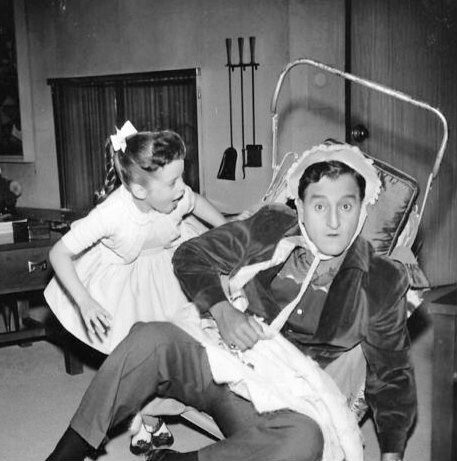 It was his first movie, which funnily enough was directed by Robert Wise, who directed the Sound of Music. BPE ~ Somebody… was a boxing movie, wasn’t it? Angela ~ It was; about Rocky Graziano. And with Pier Angeli! I had three lines, and I was only three years old. Then I did another movie – Something Of Value – with Rock Hudson and Sidney Poitier, who stabbed me to death behind a curtain. BPE ~ He stabbed you behind a curtain? Angela ~ Yes, because, think about it; it was in the fifties. So I was behind a curtain. You know, in those days they didn’t show you everything. They let your imagination take you there. BPE ~ Those were the good old days. Angela ~ Oh, I so like it better than having it in my face. BPE ~ So you went from being a three year old murder victim to playing Danny Thomas’ daughter? Angela ~ I did! When I was four, I went on the interview for “Make Room for Daddy”, with a British accent yet. They had seen a lot of kids, because they wanted Danny to marry again. He had been married in the first few seasons, then he was single for a year, and ratings started to go down. So he marries a character played by Marjorie Lord. I was actually Marjorie Lord’s daughter. That’s a trivial pursuit question, by the way. Yeah, I started then, at four, and went for seven years. 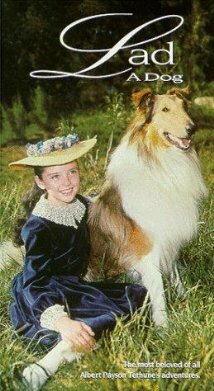 BPE ~ Were you as sassy a child in real life as your character Linda Williams? Angela ~ Noooo. Nothing like that. I came from a British family. It was so much fun to be able to put that hat on and wear it. I would never talk to my parents like I talked to Danny and Marjorie. I would never go, “Aah!”, with the hand, or say something sassy. I loved it. I also really enjoyed shooting the show. We did it like a play every week. It was a live performance, in front of a live audience every Thursday. We just did it through. You know, when you watch them, you realize that these three-camera shows were great training for thinking on your feet. Danny would always change his lines. BPE ~ That was shot at Desilu, right? Wasn’t the three camera set up Desi Arnaz’s idea? Angela ~ Yes, that studio, boy, I can see it in my mind to this day. And Lucy, of course; they did do a couple of shows with us. My very favorite one is where the Williamses and the Ricardos exchange houses. It was an hour long show. I can see the whole thing in my mind. 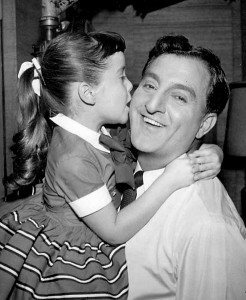 Danny and (producer) Sheldon Leonard were partners and were creating shows all the time. Andy Griffith was the Sheriff on our show, and then they did a spin-off, and that’s where the Andy Griffith Show came from. The same thing happened with Joey Bishop. A lot of actors that we had on our show – like Bill Bixby – went on to do other shows. BPE ~ Danny and Sheldon were both pretty savvy judges of talent. Angela ~ Yes, they were. They lived it with their heart and soul. I remember Danny saying, “Well, I was up all night with my little light over the script, and I worked on it to make it work.” They got what humor was at that time, what people wanted to hear; there was always a moral to the show – a bit corny today, but I love them! BPE ~ Those shows from the 50’s and 60’s were so dear. Angela ~ They were simpler, less abrasive; maybe more surface, but sometimes people just need that in their life. BPE ~ They’re funny as Heck. Angela ~ They are. I mean, Danny did have a wonderful sense of humor, and he laughed at himself. He made fun of himself! And he was very very successful; the whole show went for 11 years. I was on it for seven. Actually, Danny let me out of the last show so that I could start work in Salzburg on The Sound of Music. He didn’t have to do that. I am forever appreciative that he did. BPE ~ Your two succeeding fictional father figures were played by Christopher Plummer and Guy Williams. Both great actors in their own right. Angela ~ Exactly. When we were shooting Sound of Music, I had no idea how gorgeous Christopher Plummer was. When I got older… (laughs). He brought an edge to that movie that did not make it saccharine. I think he was perfectly cast for that part. There’s so much subtlety in his performance. You know, (Von Trapp) was just a hurting guy whose wife has died, and he didn’t want to be mean. He was this captain of a ship, so he ran his house the only way he knew how, and I just love Chris’ interpretation of him. For Julie, it’s hard to not be sweet, because she’s got this persona about her. And that gorgeous voice. BPE ~ I saw Plummer in Barrymore, and I was absolutely blown away by his performance. Angela ~ Yeah, he’s something else; he really is. I don’t think Sound of Music hurt his career the way he thought it would. I think it brought his name to the forefront as being a really great actor. BPE ~ Guy Williams had played Zorro for Disney before being cast as Professor Robinson. Angela ~ He had. He was gone way too soon. So sad to hear of his death, but… It’s kind of shrouded in mystery, I guess. He had a heart attack in Argentina, but he was lovely in that part. He embraced that kind of astronaut and being the head of the first family in space. The show did shift into a different show in the second year. I can’t say that I hated that or I loved that; whatever. It was just a whole different show. Originally, it started off as a very serious drama, and that was cool. The black and white season is one of my favorites. BPE ~ Some people say some of the effects were a little cheesy. Angela ~ Well, it was television in the 1960’s. Before CGI, remember. So, we did have explosions right in front of our face; they weren’t put in later. One of the stories that I tell in the book was that Guy had forgotten to turn the light off on his laser gun, and ended up shooting all of us. They had to reset a whole earthquake scene again. You know, that would never happen today, because they would just put the light on the laser gun itself. The Bloop, which is the chimpanzee with the big ears, was also there for all these explosions and stuff. She never freaked out and left; she was a real pro that chimp. BPE ~ Talking about how the show changed in the second year, I have to ask about Jonathan Harris. I saw a picture on Facebook of you at a party with Jonathan and William Shatner. Angela ~ (Laughs) Yeah, I know that pic. BPE ~ I’ve heard Bill Mumy say how much he appreciated Jonathan. Angela ~ He was lovely; very funny. He was the best storyteller I have ever met. He was so appreciative of having a job that he went to every day. I think he was a smart guy, too. I mean, he took a series that was going in one direction and totally changed it into one that was about himself. 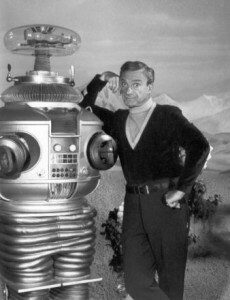 BPE ~ Lost in Space basically turned into the Jonathan Harris show at some point. Angea ~ Yeah, it did. You know, the show did get silly. I have no regrets about any of that. It was the way the show went. I was just happy to have a paycheck every week. So I think Jonathan was a big part of that, and he created this very memorable character. If he had been playing that other, darker character, people would not be talking about him today. They wouldn’t be sitting there making jokes about what a bumbling character the robot was. He created a visual and verbal character. BPE ~ The original persona of Dr. Smith was such a darkly drawn character. Angela ~ He killed somebody in that first pilot. I was talking about that with my dad; he never got over that. He was like, “He was a really bad person.” And yet, it was kind of a soap opera, you know? They just put that under the rug, because this character was working. A lot of people forget that. But they will see it, if they look at the Blue-ray, because the original pilot is included. BPE ~ Was Irwin Allen instrumental with you being cast in the show? Angela ~ Oh, it was totally him that cast me in the show. I got a call to go in and meet Irwin Allen. I walked in, and what I remember (this is so many years ago, but it’s funny, the things that stick with you) – is this huge wood-carved desk and this little man sitting behind it. The first thing he did, he looked at me and said, “Ah, I’m so glad you are the age you are. I thought you would come in smoking a cigar.” That’s so weird. I think he was a big fan of The Danny Thomas Show, and he thought, “God, I wonder how old she is”. And he just put the cigar with me being on Danny Thomas and thought, ‘Well, maybe she’s in her 20’s now and smoking a cigar, all grown up’. It was the weirdest thing. BPE ~ I guess, looking back, one could have almost seen Linda Williams smoking a cigar at eight or nine, though, right? Angela ~ I guess so. (Laughing) She was sassy enough to do that. So, I don’t know, but he cast me right away. Originally, in the script, Will and Penny were supposed to be twins. I think when Bill went in, it just clicked. It was a good combo. The relationship between Will and Dr. Smith, this boy and – you know, Bill had a lot of experience, with Twilight Zone and all of that. He was a good catch; I also think the two of us made a good brother and sister. We had a blast doing the show. The memories that came up when we were doing this book were just really fun. I’m not gonna give them away. BPE ~ No spoilers here. You’re still close with Bill? 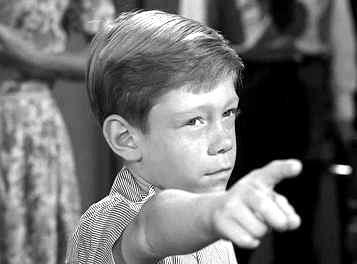 Billy Mumy wishing someone into the cornfield in a screenshot from the Twilight Zone episode “It’s a Good Life”. Angela ~ Very. We have been sitting at my computer writing this book for the past 4 or 5 months now. But we also wrote a fantasy adventure book; it’s a fairy tale that’s not really a fairy tale. That will also be coming out – I’m hoping – before Christmas. It’s called, On Purpose. It takes place in three different worlds, and it took us a couple of years to write that. We actually revisited it, and we’re going to get it published this year. We’re very good friends. 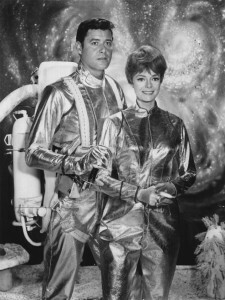 BPE ~ Lost in Space was on during the height of the space race. Did that create a special feeling for you personally or for any of the other actors on the set? Angela ~ Oh, absolutely. I was fascinated with space and that made it very exciting. And I know it captured June Lockhart’s imagination, too. It was something that all of us dreamed about happening, but it just didn’t seem a possibility. And having a family up there – I mean, it was so weird to have 1997 (the year the show is set in) come and go. We’re close, but it seems like you have to wear a lot more stuff than we did. But I think it captured so many imaginations. Bill and I took our sons to NASA and saw the Discovery launch. We had so many NASA technicians and astronauts come up to us and say, “It was because of you guys that we went into the space program.” So, it totally grabbed everybody’s imagination at that time. People still dream about that stuff. We’re not the only ones here. BPE ~ And if you find you can’t dream because you’re awake in the middle of the night, you can always listen to Coast to Coast AM. Angela ~ George Noory? Yeah, I’ve been on his show before. Bill and I both were; I think it’s on YouTube. I don’t know; there’s just something about it. BPE ~ Do you keep in touch with other friends from TV and movies? Angela ~ Of course. We see Mark and Marta on and off. And the same with The Sound of Music group. It depends where your paths cross. Martin Milner, Kent McCord and Angela Cartwright in a screenshot from Adam-12. BPE ~ Preparing for this interview, I came across a picture of you the other day with Martin Milner and Kent McCord. Angela ~ I was just watching Sunday Morning with my husband, and I said, “Oh, I should really post that picture on Facebook from One Adam-12″. Nice guy; it was sad. I mean, I didn’t know Judy Carne had also passed away. That’s why we gotta make each moment count, don’t we? BPE ~ This year’s Mid-Atlantic Nostalgia Convention also features a reunion of the cast from My Three Sons. You were in two episodes of that show, and I had to laugh when I read the plot summary for the second one. I remember seeing that episode! Angela ~ I was Chip’s girlfriend! I happened to catch that, not too long ago, though I can’t remember my name. BPE ~ Debbie. The name of the episode was “Chip and Debbie”. Angela ~ It’ll be fun to see Barry (Livingston) at the Nostalgia show; I haven’t seen him in several years. I see Tony Dow pretty often, but I haven’t seen Barry and Stanley (Livingston), so that’ll be fun. BPE ~ Do you ever watch your films with your grandkids? If so, what is their reaction when they recognize you? Angela ~ It was funny; the other day, a movie I did when I was 9 called, “Lad, a Dog”, came out on DVD. I purchased it, and when it arrived, I happened to be babysitting my 18 month old grandson. So I put it on, and he was fascinated by the dog, the collie. I kind of skipped through the fire scene and the snake one; I didn’t think he needed that in his life. But he loved the dog show, so that was really funny. We have a sheltie, which is like a miniature collie, so I’m sure he was putting that together. But that’s a lovely movie. I have sung Sound of Music songs to him, too, and he loves those. And now I have a granddaughter, who I know is going to be some kind of performer. She’s hilarious. I have a feeling I’ll be doing quite a few Do-Re-Mi performances for them. BPE ~ Would you want to see the grandchildren follow you into acting? Angela ~ I think that, if this is what brings them happiness, they’ll go for it. It’s a tough business. I thought my son would go into it; he’s a really good actor. But he just loves business; he loves the challenge of using his mind in business, so that’s the path he’s taken. My daughter, on the other hand, has become a producer. She produces that Holly Robinson t.v. show for Oprah, For Peete’s Sake. So she liked being behind the camera, which I must say, I really like too. You don’t have to sit in the make-up chair and all that stuff. But I do love it, there is an excitement about acting. BPE ~ Most people know you as an actress, but you’ve also had this amazing art and photography career. Angela ~ I’ve been hooked on photography since I was 15. I’ve never been one to just sit around. When my kids got older and they started to carve their own lives, I really had to examine what I wanted to do and where I wanted to go. I started to set my sights on things I had never done before. I had never taught before; I had never taken my photography and put it in a gallery before; I had never been a curator before, and I totally did that. And now, I’m designing jewelry. There were all these goals that I set for myself, and I made them happen. That’s how I live my life and that makes me very happy. And now I’m going to be leading these trips with Craft Tours next year! We’re going to Ireland where I’m going to teach some of my hand-painting techniques in the beginning of June. And then I’m going to take some people to Salzburg and give them my take on the Sound of Music and the things that happened at different locations. That’s going to fun; I’m really looking forward to that. I’ve got some surprises up my sleeve; it’s not going to be a regular tour, that’s for sure. BPE ~ I’m sure this is probably a question you get asked a lot, but do you have a favorite memory from your acting career? It would be hard to narrow it down to one. I have some highlights. Filming the Sound of Music was definitely a highlight. I was fortunate – and it gives credit to the closeness of my family – that my mom went to Austria with me for three months but my family came over for a while too. She couldn’t bear the thought of not being with them. So that was kind of a highlight, not only to have all these kids doing this movie and singing and dancing, but my family was there, too. I’m also really proud of my kids. That’s not part of show business, but it’s cool to make these human beings and see they’ve got a purpose; their lives have meaning. That’s a cool thing to observe.